Affordable Radon and Mold Solutions was formed in 1993 to fill a needed niche in the Indiana and Midwest market for a service, quality, and technology driven environmental company. ARMS has always strived for continuous improvement in service, quality of the installed product, performance of the environmental system, and overall quality of the client and service provider relationship. ARMS is proud to be the winner of the Angie’s List Super Service Award, the F.C. Tucker Homelink Best in Class Award, and the recipient of many letters, notes, and e-mails recognizing the quality of our environmental systems, and the expertise of the ARMS team of technicians, testers, consultants, and office staff. ARMS is a full service environmental remediation company providing comprehensive, state of the art, value driven, radon mitigation, mold remediation, and remediation of other soil born volatilizing contaminants. We service residential, corporate, commercial, and government clients. We are recognized as the industry leader in this market and therefore include among our clients many of the most respected Realtors in the Indiana, a world leader in the pharmaceutical industry, August Mack Environmental, Prudential Relocation, GMAC Relocation, Home Buyers Preferred, the U.S. Department of Defense, National Rail Road company, and many others too numerous to list. 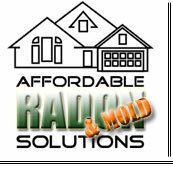 Affordable Radon and Mold Solutions would very much like the opportunity to earn your business. We hope that a combination of superior workmanship, highest quality materials, and a more comprehensive and effective environmental solution, will result in a mutually beneficial, and long term, relationship. We encourage our clients, prospective clients, and interested parties, to let us know how we might better serve our customers. We are organizationally dedicated to earning your trust and business.